I am going to start with what inspired me as a child. Great stories and art. Terry Brooks, Robert Adams, Stephen King and Margaret Weiss/Tracy Hickman as well as the writers of all of the D&D material of that era. I was in their worlds and wanted to go back, that is what inspired me. 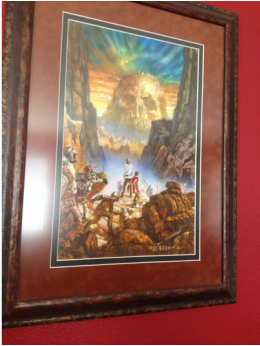 Equally the artists of that time inspired me, the covers of those books, the art for D&D-Elmore, Easley, Holloway, Earl, Dee, Kelly and many others. I always loved the art, it inspired me to go into my mind and think of what else those characters might be doing. As I grew up I used those inspirations and thoughts and created interesting ideas and I was fortunate enough to get some into print. Even more amazing is some people actually like them! 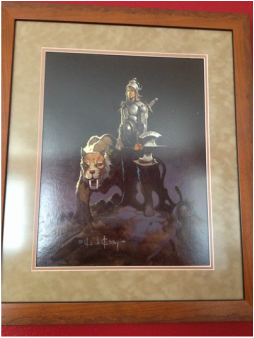 I have/had the pleasure of working with Holloway, Easley, Lockwood, Szczudlo (to name a few) and get some art from some of the great fantasy artists of this time and have them hanging in my home. I do not go to bars, go gambling, drink or smoke, I spend my time and money living in what I like to call Nerdvana-my house filled with art, props, books, games and fun. I consider myself very lucky to have this life and I needed to thank those from the past, present and future- collaborators, fans, friends and family-THANK YOU! What inspired me to write about this was the great news that in 2014-2015 it appears we will have 4 more The Awakened books available! The Awakened is already out on Amazon, we have book II in 2014, The Awakened Modern, book III and an eBook tentatively called The Awakened: Island of Bones for 2015, and let's not forget about the RPG setting to accompany this setting. I am just so grateful for the opportunities I get to enrich my life with the fantastical and I hope it shows through in my work. Above is a few pieces from my personal collection I have, maybe they will inspire you! CSP Expanded Races PDF's for C&C are on sale, and another should be available soon. We have one week left on our Kickstarter and a long way to go. We have some great plans for RPG's and future Kickstarters so Fall of Man will be taking a break but it will be back! Week in Review 2/23/14 Edition-Awakened Update!